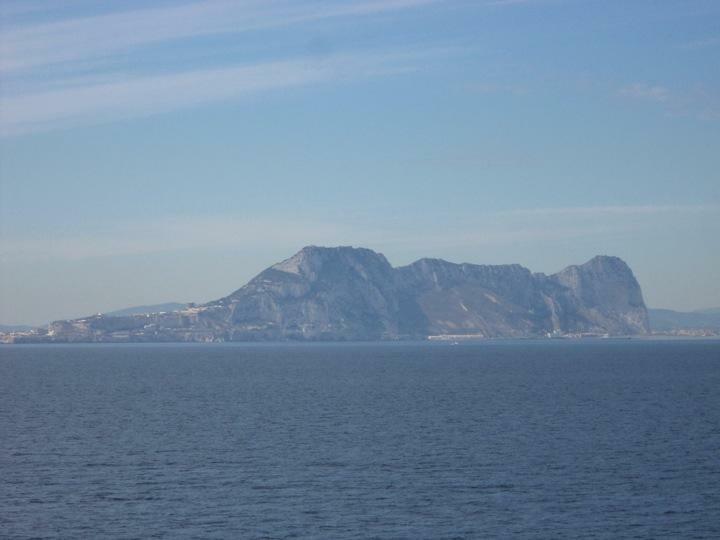 the highlight is passing through the straights of Gibraltar. Well I have to say its pretty impressive as we sail past the Rock. It is unmistakable I've never seen it before but you know straight away where you are. Opposite is the other pillar of Hercules in morocco which by the way is much closer that I had imagined. Its 16 miles I'm told but when you are in the middle of the straits and 13 stories above the sea it looks really close either side. We continued around Gibraltar and past the bay of Cadiz, past Trafalgar with all the history attached to those sites. Before you know it you are out in the Atlantic and heading North, with a swell that somehow you expect of that ocean. Observations: dressing for 4 seasons: it's funny as you look at dress on the ship. On a day like today sunny but with some wind if you get the right spot out of the wind but in the sun you can sit in your swimwear comfortably. You still see some walking around he decks in trousers shirt jumpers and overcoats. Strange thing is is your are on the 13th floor out in the wind so that is not overdressed! Another quirk of on board life. Dress codes; the dress codes are published every day in the Horizon newspaper. They are not too bad roughly one casual day followed by a jacket and collar then casual and then formal bow tie (this only applies for dinner and two of the bars. So after 7pm). Of equal interest to the casual observer such as myself is the fact that Marks and Spencer are so well represented. How unfortunate are those who took the credit card to M&S and splashed out on Blue Harbour's finest and Autograph. They form what amounts to an advertising billboard for M&S along the promenade deck. There they sit in M&S finest side by side, so glad that I'm not one of them (yet). Primark are not nearly so well represented!